The KTM 350 EXC-F engine features a design with similar dimensions to the KTM 250 EXC-F, but delivering 450-style torque and power over the entire rev range. The architecture with an optimized shaft configuration makes for excellent mass centralization and effortless rideability, at only 28.5kg. That’s including the comfort of an E-starter. This makes the KTM 350 EXC-F brilliantly suited to adventurers looking for the ultimate combination of power and weight. And it’s Euro IV homologated, so it’s green and KTM orange at the same time. 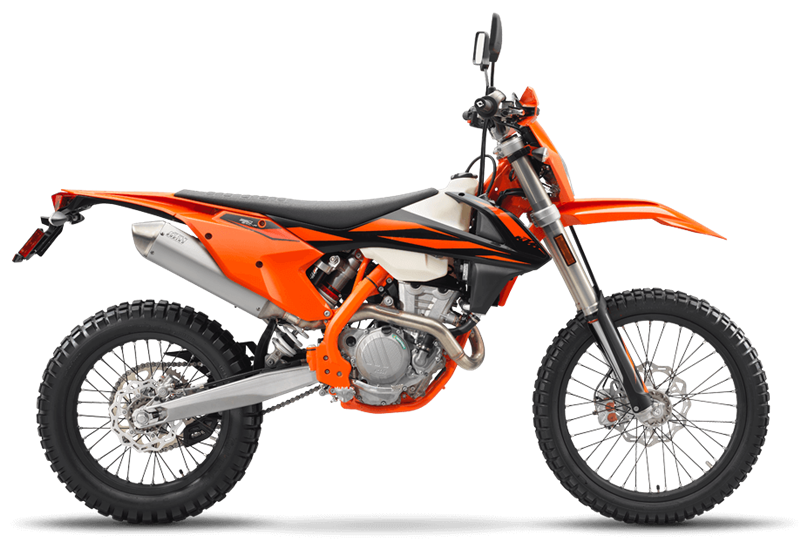 CLUTCH The KTM 350 EXC-F employs the KTM-developed DDS clutch (damped diaphragm steel) with a wear-free steel basket and extremely heat resistant clutch plates and nitrated steel liners. This clever design employs a diaphragm spring instead of the usual coil springs, making for considerably easier clutch action. A diaphragm spring also leaves sufficient space for a damping system to be integrated into the clutch hub. The goal is traction, but durability is as well. Light operation and telepathic amounts of control are standard with this hydraulic Brembo actuated clutch. E-STARTER The KTM 350 EXC-F is fitted with a unique E-starter as standard, which is a clear advantage when it comes to crunch time in the heat of battle. A strong starter motor made by Mitsuba will fire time and time again at the push of a button. Even under extreme conditions, thanks to its more heat resistant O-ring.